What do you do to get ready for a move? Even if you’re moving for a better opportunity, the very act of disassembling one’s entire physical existence, packing it into a gigantic aluminum box then reassembling it someplace different, (a place that your stuff was NOT purchased for, I should add), is guaranteed heartache. How much heartache depends on how well you prepare; and your budget, <sigh…>. First off, everyone should at least consider a professional moving company, (Janet is outstanding, but get a quote from a few of them before you make the right decision and engage her), then take a hard look at what else you should be doing while the pros are, packing and loading all your stuff, quickly and efficiently. It might not make sense for you, but the speed at which professional movers can pack, load, transport, then unload your household goods, (all while you don’t injure yourself), is astonishing. They have the bodies, the space, the trucks, the equipment, and the know how to make it happen, all at a pre-negotiated, (as in predictable, like you can budget for it), price. Find or buy a closed sided portfolio with separate tabs to keep track of everything, you’re going to need it. At the very least, it is a catch all that will secure your receipts and notes for the move. At best, you’ve labeled the separate compartments and FILED each note, proposal and receipt that you get along the way. Old/New Utility Companies – Establish what needs to happen: If you’re going to lease the property, you need to leave everything on so the property can be turned over and shown effectively. If you’re the renter, coordinate with the owner or manager to transfer responsibility to the appropriate party the day after you leave. Security System Provider – Are you under contract with the provider? Do you need to buy your way out of it, or will they transfer service to your new residence? Medical – Do you need to change insurance companies? Find out how medical history is handled/transferred between your old and new provider, do you need to do anything? Are your children’s inoculations up to date? Are there additional inoculation requirements at your new location? Pets – Old/New vet referrals, standing prescriptions etc. Banking – Is your old bank represented in your new town, or do you need to change banks? DO YOU HAVE A SAFETY DEPOSIT BOX? Insurance – Auto? Health? Life? Property? Is your old home going to be a rental? Did you change your coverage to a Landlord’s Policy? Credit Card Companies – They will find you, so you might as well let them know. Vehicle Registration – Changing states? If you’re moving out of CA, you’ll probably be pleasantly surprised at what it costs to register and insure your vehicle almost anywhere outside the Golden State. Household Inventory List – This might be accomplished with a thumb drive with digital photos of everything. This is in no way an endorsement, but there are apps out there that will catalog everything for you, this one happens to be for an iPad. One more step might be to open up your Craigslist account at the same time and cull the herd while you’re building your inventory: Your mother’s hope chest goes into the inventory app, while your art collection goes into the “Moving Sale” Craigslist ad. Do you have nice stuff? Get it appraised just in case, (though it might be hard to make a claim if you’re doing the moving, but check with your insurance company). While you have Craigslist open, suppress the urge to buy more art and start surfing for “Moving Supplies”, “Packing Supplies”, “Boxes”, “Wardrobes”, “Packing Paper”, “Dollies”, “Moving Equipment” etc. This stuff is frequently free to haul away, but half or quarter price for heavy cardboard moving boxes is better than full price. Start packing early – What can you do without for the next month or so before the move? Seasonal clothes? Your snow-globe collection? The family library? Clear a room or a spot in the front of the garage to stage the early packing right next to the place for the Craigslist sale items, (insert standard disclaimer about Craigslist Transaction Safety Here), that you can’t haul to a safe location. Anything borrowed or out for service? Library books? Dry cleaning/tailor? VHS tapes from Blockbuster? Yard Equipment? Firearms? Time to gather them in and get them home. Does your mover have a list of things they won’t move? Is there anything that they will take but are you sure you want them to? All the insurance money in the world will not replace your grandmother’s vase that was specifically left to you. Remember that most moving vans aren’t climate controlled, so anything that might be affected/damaged by extended periods of heat and cold should be handled separately. Do you need to rent/purchase a smaller trailer or van for personal items? Clean your refrigerator and freezer, (probably should have started consuming that stuff awhile back in order to minimize what you have to give away anyway). If you’re taking them with you, unplug them after they were cleaned and PROP THE DOOR OPEN, (I’m a property manager, ask me why I know that). Set aside your travel needs in terms of clothing travel supplies, cash and entertainment. Everything else will be sealed in the aluminum coffin until it gets to the other side. So, not a comprehensive list, but a place to start. Hopefully the reason you’re moving is because you have a terrific opportunity, but we know that isn’t always the case. Regardless of why you’re moving, however, much of the pain can be avoided with just a little planning. 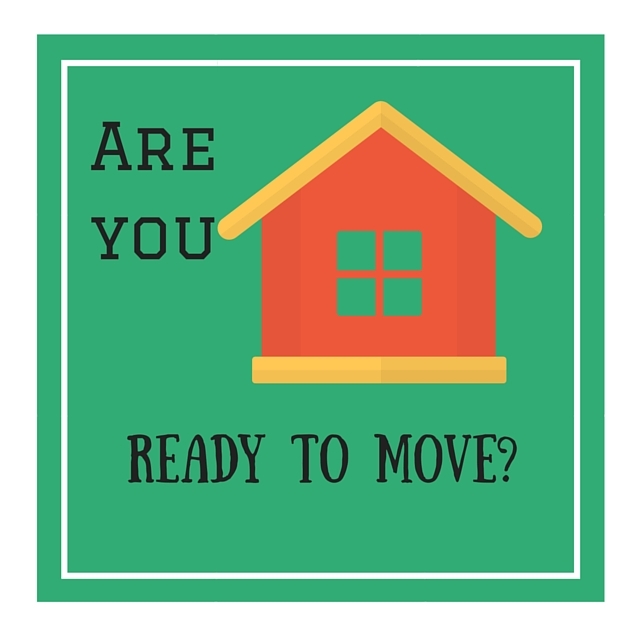 Make sure that you are ready to move!